What sounds do fish make? Have you ever wondered if fish make sounds? Watch this video and find out! Cats meow, dogs bark and goats ... er, do whatever that noise was! But here’s a curious question – Do fish make sounds? Well, it depends on the type of fish! The gurnard – also known as the sea robin – is a real chatterbox, grunting pretty much non-stop. Cod, on the other hand, only get noisy during the egg-laying season. The males sometimes make low-pitched thumping sounds. In general, fish make sounds for one of two reasons – to attract a mate or to scare away predators. Often, they make sounds using an organ called the swim bladder. The swim bladder is filled with air, and its main job is to control the way the fish floats. They fill it with air to float higher in the water and empty it when they want to sink. But some fish can also play it like a drum, by flexing their muscles to make the bladder vibrate. These vibrations make the sound. So, yes – some types of fish do make sounds. But don’t bother waiting for your goldfish to start a conversation – they're the silent type! So, let’s go over that again. Some fish make sounds to attract mates. And some make sounds to scare away predators. And often, this involves vibrating an organ called the swim bladder. Some fish make sounds by vibrating an organ called the swim bladder. 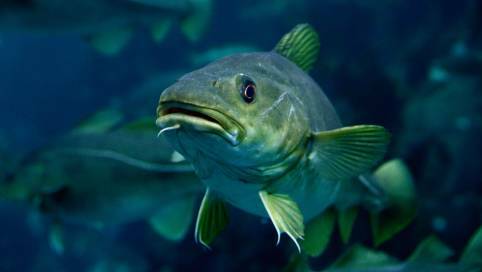 Some fish use sounds to attract a mate or scare away a predator. What is the main job of the swim bladder? How do fish use the swim bladder to make sounds? Why do fish make sounds?